The Olé platform activates the university's co-curricular learning outcomes by articulating what we hope our students learn outside the classroom, framing the learning experiences we offer for our students, and motivating students to engage in their learning. 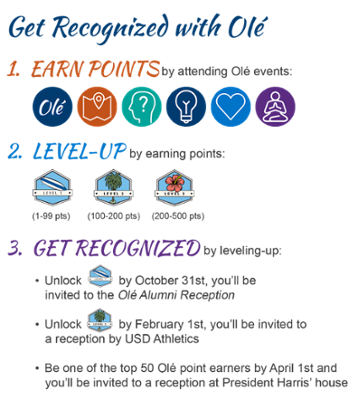 With the Olé platform, students earn points by attending designated Olé events. As students earn these points, they can unlock new Olé levels and recognition opportunities.